To achieve a strong foothold in the industry, we are betrothed in offering our customers with good quality Printed Coffee Mug. These gifts are accurately crafted by our extremely talented professionals using supreme grade basic material and modern techniques. Incorporated in the year 2014, Star Ribbons is reckoned as amongst the eminent manufacturer and wholesaler of ID Card, Collage Frame, Lanyard Hooks, ID Card Holder, ID Card Lanyards, MDF Tea Coaster, Printed Wrist Band, Printed Coffee Mug and MDF Computer Mouse Pad. 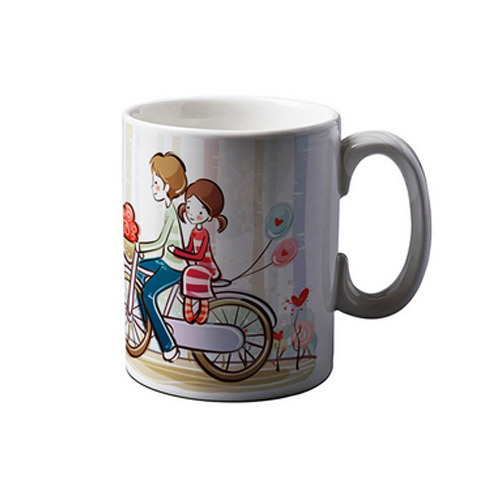 We are the service provider of Mug Printing Service. These products are designed by using superior quality basic materials with the assist of modern tools and technology under the guidance of extremely talented professionals. Moreover, the basic material we use in designing and crafting process of these products is sourced from certified and reliable vendors of the domain. Owing to its attractive design, long lasting sheen, vibrant color combinations, durability, reliability and high quality, our offered array of products is widely appreciated and acknowledged by our esteemed customers. We offer our products in a wide variety of patterns, colors, designs and can also be customized as per the specifications offered by our esteemed customers.